The consortium, known as the Molecular Education and Research Consortium in Undergraduate computational chemistRY (MERCURY) was founded in 2001 with the goal of establishing research collaboration among seven computational chemistry faculty from primarily undergraduate institutions (PUIs). It currently consists of 27 faculty in 25 institutions. The consortium members share NSF-funded computational facilities and meet at an annual MERCURY conference to network and present their research. The consortium was founded in 2001 by George C. Shields (then at Hamilton), Maria Gomez (then at Vassar), Carol Parish (then at Hobart & William Smith), Marc Zimmer (Connecticut), Jeffery Greathouse (then at St. Lawrence), Ramona Taylor (then at Holy Cross) and Martha Reynolds (then at Colgate) to share access to state-of-the art computational power and numerous opportunities for student and faculty collaboration, mentoring and cross-fertilization. The consortium initially received $780K from the National Science Foundation’s Major Research Instrumentation program (NSF-MRI) to purchase computational resources in 2001. MERCURY institutions provided $615K in matching dollars and we used these funds to assemble an excellent collection of computers that provide heavily used computing cycles for our faculty and undergraduate students. We received a second NSF-MRI grant in 2005 to buy a Beowulf cluster and to expand the consortium across the country. Over the first three-year grant period, the seven faculty and their students published 44 research papers in peer-reviewed journals. This equates to two published papers per year per faculty member, which is four times higher than the usual productivity of a faculty member at a PUI. Further, in the four years since the consortium was established, the number of external grant awards received by the faculty more than tripled and, together, the faculty raised more than four million dollars to support computational chemistry research involving undergraduate students. The bulk of this funding was used to provide summer stipends, which allowed our students to immerse themselves full-time in research. We credit this activity with our high rate of success in recruiting and retaining students, particularly those from underrepresented groups. We worked with more than 110 undergraduates on research projects during this time. The consortium was founded in 2001 by George C. Shields (then at Hamilton), Maria Gomez (then at Vassar), Carol Parish (then at Hobart & William Smith), Marc Zimmer (Connecticut), Jeffery Greathouse (St. Lawrence), Ramona Taylor (Holy Cross) and Martha Reynolds (Colgate). Its growth and evolution can be traced over the years below. The faculty in the consortium were Jeffery Greathouse (St. Lawrence, environmental), Maria Gomez (Vassar, materials), Carol Parish (Hobart & William Smith, physical organic), Ramona Taylor (Holy Cross, environmental and materials), Martha Reynolds (Colgate, bioinorganic), Marc Zimmer (Connecticut, bioinorganic) and George Shields (Hamilton, biophysical). Over the three-year grant period, the seven faculty and their students published 44 research papers in peer-reviewed journals with their students. This equates to two published papers per year per faculty member, which is four times higher than the usual productivity of a faculty member at a predominately undergraduate institution (PUI). Further, in the four years since the consortium was established, the number of external grant awards received by the faculty more than tripled and the MERCURY investigators raised more than four million dollars to support computational chemistry research involving undergraduate students. The bulk of this funding was used to provide summer stipends, which allowed students to be immersed fulltime in research. Mentoring provided by senior researchers to junior researchers, and networking at the national meeting, have contributed greatly to the high rate of success in recruiting and retaining students, particularly those from underrepresented groups. The seven MERCURY investigators worked with more than 110 undergraduates on research projects during the first three-year grant period. The consortium purchased two workstations for each institution to serve as local graphics and a 32 processor Origin 300 and an 8 processor Origin 300 located at Hamilton College. In addition, we built a 30-node Beowulf Cluster for the consortium. We used NSF funds to hire a System Administrator and we organized an annual conference for any and all undergraduates to present their work in computational chemistry, to learn from our invited speakers, and to network with other students and faculty in attendance. Undergraduate faculty Maria Nagan (Truman State, biochemistry), Glênisson de Oliveira (Rhode Island College, physical), Wingfeld Glassey (Hobart & William Smith, physical), and Tricia Shepherd (Westminster College, Utah, physical) joined Gomez, Parish, Shields, and Zimmer, while Reynolds, Greathouse, and Taylor left the consortium. The PI invited five additional investigators into the consortium during the grant period: Mauricio Cafiero (Rhodes College, biochemistry), Kelling Donald (University of Richmond, inorganic), Becky Eggimann (Wheaton College, IL, solvation), Daqing Gao (Queensborough Community College of CUNY, physical organic), and Eric Patterson (Truman State, physical organic). The 12 MERCURY investigators published 49 papers,46-94 which translates to 1.9 publications/faculty/year (seven PIs were in the consortium for three years; five PIs were in the consortium for one year). This is 3.8 times the national average (0.5 pubs/faculty/year). The 12 MERCURY consortium PIs worked with 140 undergraduate students, 13 high school students, seven high school teachers, and six senior scientists at their institutions over the three-year grant period. Of the 140 undergraduates, 89 were female, 14 were Asian, 13 were Black or African-American, and 12 were Hispanic or Latino. A total of 101 of 140 undergraduates were female and/or represented a minority. Our students won twenty national or international awards such as Goldwater Scholarships and Fulbright Fellowships during this period. We hosted three more MERCURY conferences in the summers of 2006, 2007, and 2008, with a total of 251 participants. Over seventy-five percent of the participants were undergraduates or high school students. Over fifty percent of the speakers and fifty percent of the participants were women or minorities. The 13 MERCURY investigators worked with 165 undergraduates over the three years of this grant. Of the 13 MERCURY investigators, five are female; and of the 13, three are Hispanic, one is Asian, and one is Black. A total of 197 personnel have worked on this project as a result of this award. This includes three other senior researchers/technicians, five postdoctoral associates (one Asian Female, a Black Female, and a Black Male), 165 undergraduates, three high school students, 11 pre-college teachers, and one post-baccalaureate fellow. Of the 165 undergraduates, 92 were Female (55%), 26 of the 165 were Asian (16%), 21 were Black (13%), and nine were Hispanic (5%). Of the 92 Females, 14 were Asian, 13 were Black, and two were Hispanic. Thus 34% of the undergraduate student researchers were minorities. Including all female and minority students, without double counting, 119 of the 165 were female and/or minority, which is 72% of the total. Undergraduate faculty Kelly Anderson (Roanoke College, physical), Sudeep Bhattacharyay and Jim Phillips (University of Wisconsin-Eau Claire, biophysical & physical), and Aimée Tomlinson (North Georgia College, physical) joined the consortium, bringing the total to 17 MERCURY investigators. We published 79 peer-reviewed papers, or 1.5 papers/faculty/year, which is three times the rate for physical science faculty at undergraduate institutions. Overall, during the three year period of this grant, the 17 MERCURY investigators worked with 200 undergraduates, and over 75% of them were female and/or from underrepresented groups. In addition 16 High School students, 2 post-baccalaureate alumni, 2 technicians, 4 post-doctoral researchers, and a staff research scientist worked with the MERCURY investigators. Overall, since 2001 when the first MRI grant was funded, the MERCURY investigators have published 234 papers, including two in Science, two in Angewandte Chemie- International Edition, 10 in JACS, and two in PNAS. We published 44 publications during the first MRI grant period, 49 publications during the second MRI grant period, 62 publications during the third MRI grant period, and 79 publications during the fourth grant period. Our peer review publication rate is 1.7 papers/faculty/year, which is 3.4 times the rate of physical science faculty at undergraduate institutions. We have worked with 563 students on research projects. Without double counting female minority students, we have worked with a total of 422 female and minority students, which is 75% of the total. Approximately half of our graduates attended graduate school for the purpose of obtaining advanced degrees in STEM fields and approximately 2/3 were female and/or minority. Since the start of the MERCURY consortium students mentored by MERCURY faculty have won more than 50 national awards, including a Rhodes, 10 Fulbright Fellowships, 18 Goldwater Fellowships, two Gates Cambridge Scholarships, and more than 15 national graduate fellowships (NSF, NDSEG, NASA). We have had more than 1200 attendees at the first 14 MERCURY conferences and we have had 87 speakers, 45 of whom have been female or minority. The consortium has attracted many more women into this traditionally male-dominated research area. Three of our research groups consisted of at least 40% African-American or Hispanic-American students. Gomez is currently Professor and Chair of the Chemistry Department at Mt. Holyoke and recently won a Henry Dreyfus Teacher-Scholar Award. She directs the Passport to Chemistry Adventure program supported by Dreyfus. Parish won this same award in 2005 and is a Professor at the University of Richmond. She won the American Chemical Society Stan Israel Award for Advancing Diversity in the Chemical Sciences in 2011, was a Fulbright Scholar to Israel in 2012-13, and became an ACS Fellow in 2015. Zimmer is the Jean Tempel ’65 Professor of Chemistry and was the 2007 CASE Connecticut professor of the year. He was named by Huffington Post College as one of “13 of the Best College Professors in the Country” in 2013. Shields held an endowed professorship at Hamilton, and is now a professor and dean of arts & sciences at Bucknell University. He received the ACS Award for Research at an Undergraduate Institution in 2015. All four are national leaders in computational chemistry research with undergraduates. Zimmer has 67 peer reviewed publications since 1990, 1865 citations, 28.7 citations/paper, with an h-index of 20. Shields has 80 peer reviewed publications in Web of Science since 1993, 4135 citations, 51.7 citations per paper, with an h-index of 28. These four faculty have five NSF grants (3 RUI; DUE; STEP) and five Foundation grants (2 Sherman Fairchild; Mellon; ACS/PRF; Dreyfus) worth over $3.1 million to support research and outreach. The objective upon forming the MERCURY consortium was to help our undergraduate research programs to flourish and this has indeed occurred as evidenced by the number of proposals and papers submitted by our members either collectively or individually. The MERCURY investigators have worked with 563 undergraduate researchers to date and published 234 papers, or 1.7 per faculty member per year, which is 3.4 times greater than the usual rate at an undergraduate institution. The level of computational resources and methodological tools available for the projects will continue to be state-of-the art with the additional resources added to our cluster. 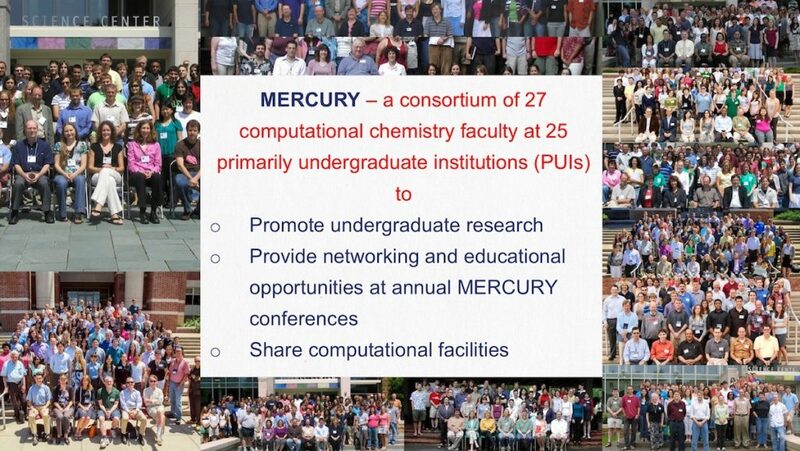 All of the faculty in MERCURY are passionate about increasing the diversity of the chemistry community; we have worked with 563 students on research projects. Without double counting female minority students, we have worked with a total of 422 female and minority students, which is 75% of the total. Approximately half of our graduates attended graduate school for the purpose of obtaining advanced degrees in STEM fields and approximately 2/3 were female and/or minority. Since the start of the MERCURY consortium students mentored by MERCURY faculty have won more than 50 national awards, including a Rhodes, 10 Fulbright Fellowships, 18 Goldwater Fellowships, two Gates Cambridge Scholarships, and more than 15 national graduate fellowships (NSF, NDSEG, NASA). We have had more than 1300 attendees at the 15 MERCURY conferences and we have had 92 speakers, 46 of whom have been female or minority faculty. As junior faculty in MERCURY become senior faculty, they help mentor our new colleagues on how to maximize their research productivity with undergraduates. Our research projects utilize the tools of computational chemistry to address significant problems in environmental, materials, physical and biological chemistry. We find that our students are naturally drawn to these computer-based projects and often become involved in research early in their undergraduate careers, often as first years or even pre-matriculated students. Mentoring students in meaningful research projects is a valuable and integral part of being a research active chemist at an undergraduate institution. The faculty who comprise the MERCURY consortium choose careers at PUIs with the intention of focusing their energy on undergraduate student involvement. Undergraduates are typically our only coworkers and the success of our research programs depends heavily on effective mentoring. The quality of student learning in such a highly attentive atmosphere is one of the reasons why a disproportionate number of Ph.D. chemists received their baccalaureate training at undergraduate institutions. The faculty involved in the MERCURY consortium have mentored over 563 undergraduates, of whom approximately half have gone on to graduate school, and a disproportionate number of these students have been women and minorities. The MERCURY Consortium annual meeting is one of the highlights of our work. Students and faculty benefit intellectually and socially from engaging in detailed scientific discussions with others. The ability to discuss science with others passionately engaged in the same subfield is a rare opportunity for an undergraduate and we anticipate that these exchanges will further our students’ education and continue to encourage students’ interest in pursuing graduate studies in chemistry. Our annual meeting is open to all undergraduates and all faculty members, from any institution. We have subsidized the meeting costs and brought in six or seven outstanding speakers each year (~three female speakers each year) to make for a quality event. The first six conferences were successful, with an average of 75 attendees (40 undergraduates, 35 faculty; 45% of the speakers and attendees were women) coming from as far away as California, Texas, and Canada. Three of our research groups consist of at least 20% African-American or Hispanic-American students. Student researchers mentored by MERCURY faculty have gone on to win a Rhodes, six Fulbrights, a Gates Cambridge Scholarship, and fourteen Goldwater Fellowships, and have matriculated to a variety of graduate institutions including Columbia, Oxford, Yale, Wisconsin, and Minnesota. Joan Frye, the Director of the MRI program at NSF, called George Shields in September of 2005 to inform him that we had submitted the best final project report that she had received over the last five-year period, and that she was going to use our project as the focal point of her discussion with the next MRI outside review panel. The consortium members share high performance computing (HPC) facilities to advance their research. The first three HPC resources included commodity Linux clusters and shared memory machines from SGI. The fourth and current Linux cluster named Marcy is hosted at Furman University and it has been in full production since May 2013. Skylight, our newest cluster, is hosted at Clemson University’s datacenter and it has been in full production since June 2017.